This is a digital program--nothing is shipped to you. There are computer-generated templates for you to fill in, and a complete tutorial on how to complete the program. You will get access to all these resources as soon as you're approved for membership (usually within 1 business day). If you are an owner or manager: See my program for leadership, Beyond the Basics of Business Planning for Owners and Managers. You will get all the agent materials and tutorials PLUS all your leadership materials (online) plus tutorials for you and for you to use with your agents. See this leadership comprehensive program here. How much money did you spend on your best marketing source? Where you wasted the most money? Where you’re wasting time on activities that don’t pan out? How well your lead generating plan worked for you? How inspiring was your plan to you to motivate you through those tough times? 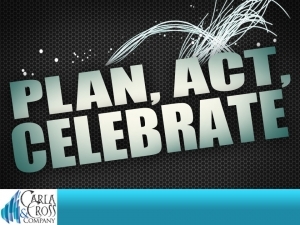 Carla gives you pointers on how to make your plan ‘live’ as she shows you exactly how to plan, what pitfalls to avoid, and tips she’s garnered about planning from the thousands of agents she’s taught to plan for success. A time management analysis tool: What’s your real job description? This isn’t the same old planning pages your company gave you in the past. These get past the numbers and right to the heart of the matter—you and your business habits. I did my first business plan, thanks to your wonderful business plan package which I ordered from you. You have taught me how to think things through, which I somehow didn't know how to do before. Thanks for everything! I really appreciate you, Carla. All the webinars are recorded, so you can access them at your convenience, and as many times as you wish. All the documents and bonuses are readily accessible at any time for you, too. All the planning templates are online, ready for you to save and fill in online. Don't settle for some planning pages you just fill in? Get the guidance and insights from the person who literally 'wrote the book' on business planning for real estate professionals. Experienced agents: Working harder, not smarter? This resource will change all that! Analyze each part of your business for the good, the bad--and the ugly. Get more results in 4 weeks with the proven 4-week re-generation plan. Break through your ceiling of achievement. Coach yourself with confidence. The market is still much more challenging than before. Now, there’s a resource to help you meet those challenges—and build a better business—in 4 weeks. It’s like hiring a consultant at $20,000—except that you’re investing only $129.95. Managers: Use this resource to coach your experienced agents to much greater success. See Managers: Putting On Track to Success to Work.